The vibrant rich oranges, yellows, reds and burgundies of Marigolds are the perfect coloured flower for October. The Marigold has many uses including quite a few for medicinal purposes. It assists in the treatment of skin irritations and the sap of the stem has been used to remove warts, corns & calluses. Because of the bright coloured hue of the flowers it is not surprising that they extract the pigment from the flower to use as a dye. Potted marigolds are edible and are also often used for a garnish on dishes. 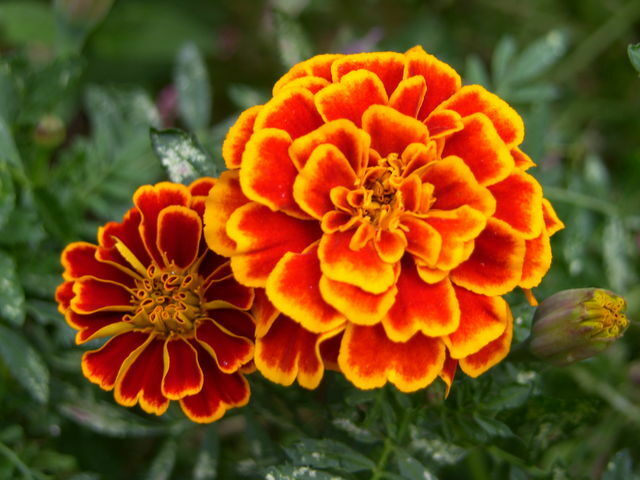 The Marigold does have a strong scent that helps keep the insects from swarming around them. When watering your Marigolds they prefer to be watered from the bottom as opposed to watering overhead as the bloom of some varieties might rot. Another helpful tip to remember is that you will get more flowers to bloom if you do not use fertilizer. The pumpkin coloured flower is a perfect representation for the Fall and October. Send a beautiful bouquet of seasonal fall flowers and bring the color of fall indoor!